I was blown away the first time I stumbled upon a painting by Sara Golish. Based in Toronto, the talented visual artist specializes in figurative drawing and painting with strong influences in Magic Realism and Afrofuturism and her depictions of women are nothing less than powerful. Sara, by gently applying seamless brushstrokes of oil paint and occasional gold leafing, is creating an epitome of feminine beauty and empowerment. I was about three years old and my parents took me on a road trip to Washington D.C. We went to the National Gallery of Art and I know at the time ­ although I was only three years old­ I was already drawing and interested in art in general. I remember seeing this painting of a ballet dancer and just being in awe! At the time I was already obsessed with ballet and dancing and I remember, in that moment, thinking­ Oh my goodness, there’s this huge painting of a ballerina! Seeing both dance and painting combined was so inspiring. I was standing there, at three years old, thinking that that was what I wanted to do. I was young, but I understood the concept of what the gallery was and I wanted to be a painter and have my work up in a place like that. Did your parents take you to many galleries growing up? I think they did. My parents have always been very artistically and/or musically inclined, loving any type of arts and theatre. From what I remember, we would see a lot of plays, musicals and ballets. Do you feel like your vision of femininity has changed a lot through the years? I think it’s impossible for it to stay the same. Everything is changing all the time, right? Absolutely. I feel like the media plays a big role in changing perspectives, “redefining” certain elements like beauty for example. Would you say that’s what you’re doing? I’m not trying to redefine beauty per se. I’m just trying to make something that there’s, unfortunately, a huge lack of in our world in general ­ positive representations of women of colour ­who are marginalized. And be a positive contributing force to those women and deconstruct Whiteness as the archetype or ideal beauty. As much as beauty is involved, it’s not that they don’t exist. I’m trying to expose this beauty as much as possible. I’m not redefining anything, it’s already there. Do you model your girls after people you know? The Moondust/Sundust aren’t but for the painted work, yes. I usually ask people to model for me so my paintings are direct references to them because I don’t alter them much. Most of my work, though, is a combination of these paintings and the stylized drawings. How did you come about developing these characters? They were actually years in the making. I would do little sketches with a ballpoint pen, stylized little doodles just for the sake of doing them. I had a feeling I wanted to make them larger, more accessible. I ended up forgetting about it for quite a while until something triggered me again and I sat down one day to figure out how I wanted to create them. I took a piece of toned paper that I had lying around and started drawing one. That drawing ended up being the first piece of the Moondust series and it’s weird because as soon as I finished it, I understood what I wanted to do. The idea ­and I’ve had people criticize me about this­ was to have one central muse. I wanted to create a prototype facial structure for all women and have fun with it. Doing different hairstyles, different jewellery, discovering the look I was going to give to each piece. Do all of them represent something different? The second series, yes. The first series I was still figuring it out. It was more heavily influenced by Afro Futurism and the natural hair movement. I was very much inspired by the rise of this movement which was why I wanted to take these faces and use different natural hair styles on them. Part of it in promotion of the idea that natural hair as beautiful. Your natural self, who you are, how you’re made, is beautiful. The first series was more general so each piece didn’t necessarily represent something specific. What gave you vision for Sundust, the second series? Basically I started doing some research. I already knew the general concept but this time wanted to base them on actual goddesses so I started looking and found that all the sun deities were male gods. I might have come across one female [sun deity specifically] within the African continent. Just one! I ended up making them up, putting together different cultures from all over the continent and embodying them as females, giving them female names. I’m all about equality, I’m all about feminism and believe everyone should be a feminist. How did the exhibition go? When I released Moondust I did it online, through my website and social media. They took off online, and I sold most of them within a month or something crazy like that, which I was really happy about. I started getting my name out there so with the new series I wanted to do something different. I gave myself a date to release them and have a show. I managed to get a venue for the opening night on the evening of the summer Solstice. The month leading up to it was hectic! I had to finish all of the pieces, work out the show on my own… I had never done anything like that before and had no idea how much work it was going to be! Looking back, I’m really happy I did because the exhibit was great and all ended up coming together really nicely. And much thanks to my family and friends who helped out! I’m interested in the criticism you’ve received. What has been the most unexpected response to the body of work? Sometimes it amazes me the things that people on the internet, when they’re not face to face with someone, will say. Though one of the things I didn’t expect was the comments surrounding the Moondust/Sundust lack of irises. I had one woman tell me she was disturbed by the fact that my girls had no eyes. They have eyes, just no irises or pupils. I don’t feel I should have to explain the reason behind my artistic decisions as a creative. I mean, they’re obviously stylized drawings, they’re not supposed to represent a real person. 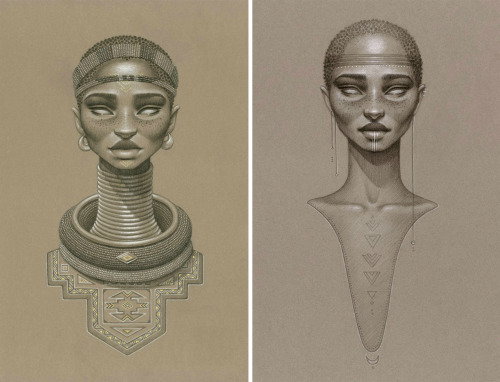 They’re sci­fi, afro­futurist goddesses. Mythological, to say the least. The expected of course is that I’m not a woman of colour. Naturally, I’ve had a lot of backlash surrounding that. A lot of it, I’ve had to ignore. I’ve done some interviews where people have specifically asked me why I choose to paint women of colour but there’s so much to get into that one question, so many layers of discussion I can have, that I can’t cover it all in one interview. Sometimes I simply touch upon different things with different people. I keep myself informed and I’m not oblivious to what I’m doing and where I stand. I always try to read things from different perspectives and I’m not trying to step on anyone’s toes with my work. I know in my heart where it’s coming from and I believe my contribution is positive. Otherwise I wouldn’t be doing what I do. Whether people choose to see it that way or not, there’s nothing I can really do about it. The bigger your voice gets, the more change that you create, the more people will be against it. For sure. The more numbers there are, the more hate there is. It comes with the territory. People criticize what they don’t understand. I’m an enigma to most, so I can’t really blame the unenlightened. What struck you in particular about the natural hair movement? There are so many girls that think their natural hair isn’t beautiful because all they see in the media are portrayals of White women. Women, generally, have a hard enough time in our world struggling with messed up concepts of beauty and what we’re supposed to look like, so to see these young girls that are being told they’re not beautiful from every angle is heartbreaking. In recent years, witnessing this strong rise of women claiming their natural hair back and shedding the chemical straightening and all the toxins is amazing. Not only that, but so many diverse and incredible natural hairstyles have been popping up everywhere because of it. I actually just had someone email me recently, a principle of an elementary school. He told me he had shown my work to his students because there was one girl that was wearing her hair natural and she was being teased about it. He showed them my work and they loved it. Then the other girls started to wear their hair natural as well and the teasing stopped. If I can make impacts like that with my work, that’s something really special to me. Really touching and warms my heart. Do you plan to stay in Toronto? I don’t. I came to Toronto for school but only meant as a stepping stone. I never thought I’d be here for as long as I have and it was never somewhere I intended to live. It’s terrible for me to say because Canada is so great in so many ways but sometimes I just can’t deal with it [the weather], you know? How has living in Toronto strengthened or weakened your artistic practice? Strengthened definitely through meeting people, making connections with other artists. I mean, everyone needs some kind of community so just being able to ­no matter how involved or not you arebeing able to be somewhat involved with like­minded people is important. It’s important to keep that balance of individuality as well as the capacity to share it. Exactly. When you meet people, for an artist who wants to get their name out there, that’s important, right? I mean, how else are you going to network? That for sure has strengthened and brought me to where I am now. Even if I don’t credit the school that I went to for my achievements, I am thankful of the people that I met there, the people that I’ve remained friends with and to still have around as close friends is really important as well. The climate. And honestly, not just the climate. People here are much colder than in a lot of other places. Are not very friendly. There’s a lot of rudeness in the city. I don’t want to say that it’s discouraging because I try to be positive but when you’re on the subway and you’re surrounded by people that seem miserable or rude, it’s frustrating. There’s that and as I said, I don’t want to stay in this climate, I can’t really handle it. I’m very much a hippie at heart and I always have been. I like to consider myself down to earth, so for me as much as there’s a cultural side to Toronto that I love, there’s people from everywhere which is amazing, in terms of the city itself, the whole concrete jungle thing is not me at all. The smoke, the toxins in the air, I can’t handle it. I find that if I’m out and about in Toronto, from fall to spring especially, I just feel like I’m not in my element. I’m uninspired. My environment is really important to me, which is what I’ve tried within my own space to create. Here, for the time being, I try to make what I can and inspire myself. Be sure to follow Sara’s work on her website and Instagram.